After the huge uproar created by Joost, in which many Joost invites were given and taken, yet another IPTV service, Babelgum has been launched. The users can use Babelgum to distribute their videos to their clients or subscribers. Ads will be displayed against your content and revenue generated will be shared with the content provider. An important feature of Babelgum is that you can do recording while watching and also search the content using tags. The quality of Joost appears to better (although I have tried it only in 1280 x 800 mode). It seems that Babelgum doesn't have content with it right now and is just in the process of gathering it. 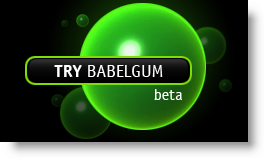 Right now Babelgum is in public Beta and you can Click here to get the invite. It is a free service and is supported by ads only. Let's see how does Babelgum flare up in this heating marketplace.